A Japanese H-2A rocket launches. KODIAK, Alaska — A spy satellite for the Japanese government rode an H-2A rocket into orbit Friday, replenishing a fleet of secret spacecraft designed to keep track of missile development in North Korea. The classified spacecraft lifted off on a 174-foot-tall H-2A rocket at 0436 GMT (12:36 a.m. EDT) Friday, or 1:36 p.m. local time at Tanegashima Space Center, Japan's primary launching base off the southern coast of the main islands. The secret satellite, built by Mitsubishi Electric Corp., is circling Earth in a sun-synchronous orbit with an altitude of more than 300 miles. The spacecraft was a more than $500 million payload outfitted with an optical camera and telescope to supply imagery to the Japanese government for intelligence, defense and civilian remote sensing applications. The spacecraft will become an operational member of Japan's optical spy satellite fleet. Japan established the space-based reconnaissance program after North Korea fired a test missile over Japanese territory in 1998. The country's spy satellites have become increasingly more advanced since then, but officials have provided no official specifications on the satellite launched Friday. The most advanced Japanese reconnaissance satellites likely provide imagery with a resolution less than a meter. 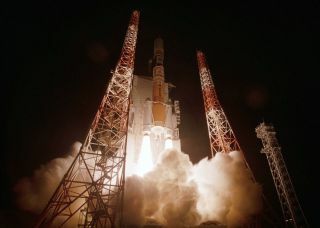 The mission was Japan's second space launch of 2011, following the flight of an International Space Station cargo freighter that blasted off in January. It was the 19th flight of Japan's H-2A launcher since 2001. Six of the H-2A missions carried Information Gathering Satellites, the official name of Japan's fleet of spy spacecraft. The only blemish on the H-2A's record was a launch failure in 2003 carrying a pair of intelligence satellites.